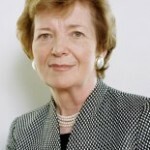 After a most distinguished career as the first woman President of Ireland (1990-1997), former United Nations High Commissioner for Human Rights (1997-2002), and founder and former president of President of Realizing Rights (2002-2010), Mary Robinson has taken on a new fight in the realm of human rights, the fight for climate justice. Climate justice links human rights and development to achieve a human-centered approach to managing the challenges of climate change. It aims to amplify the voices of those people who have done least to cause climate change, but who are most severely affected. Through the work of the Mary Robinson Foundation – Climate Justice, Mary Robinson proposes to put justice and equity at the heart of responses to climate change and to look at climate change not only as a threat, but also as an opportunity for sustainable development.